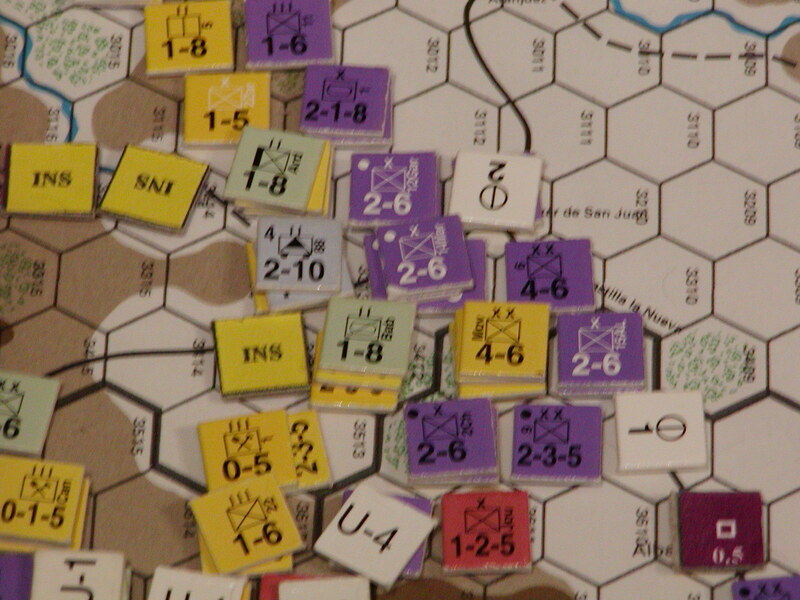 The 2LE is still in hot pursuit of the Astrurians, They were pushed to the coast and now with their backs to the wall they are trapped and annihilated. Another victory! But again at a cost. In the space of a few weeks the war has started to become very real for Miguel. The reports from their spies in Gijon is not good either, the defenders have been recruiting factory workers, school teachers, police everyone of fighting age (and some besides) and have formed a very formidable defence of their city. Miguel fears it will be some time before they are able to move against it. He hopes a lull will give him some much needed respite. Reinforcements; All divisions supported on arrival. Moves; NT transports 1-6 mg IMExp from Canaries to La Coruna. Italians arrive in SW with a view to moving on Seville. 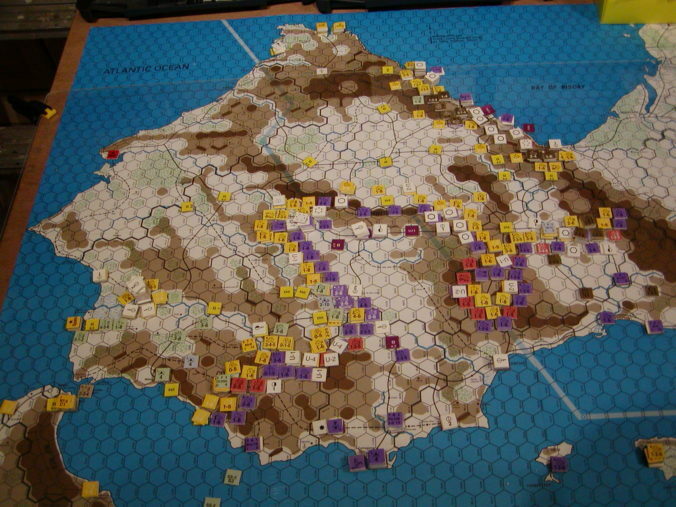 Attack 2: 1205 rough (coast 2 hexes east of Gijon), Supplied 3-6 * inf 1Cas, 3-2-6 inf 2LE, 2-6 art 1P, 2-1-8 art E, Unsupplied 1-6 13 GC attack 1-2-4 inf 13 (Ast), 1-6 eng 2 (Ast) @ 7:1 (-2) = DE Advance 1Cas. Air Activity: 2 more successful rail bombings! Sortie 2; He 51, Ju52g4e @ 3332. Replacements; ½ PA and ½ Ast SRPs received. 1-6 infs 2,9 and 1-6 art5L replaced and form 3-6* inf 1. 2-3-5* inf 9, 1-6 infs 10,40 replaced. A101 repaired. Reinforcements: all arriving divisions equipped. Moves: NT3 (with BTF-1, LtTF-1 (Bas)) collects 1-4 inf 3 (Ast) from Gijon and transports to Santander; returns to Gijon and loads 1-4 inf 5 (Ast). In exploitation offloads at Santander and returns to Gijon. All Reaction attempts by Nationalist Combat Task Force at El Ferrol fail.